As we have seen from considering the productions of American ale and porter breweries of the 1800s, English styles had a huge influence while occasionally suffering modification. An odd situation resulted, in that by 1890, say, considerable ale and stout were hopped and stored in a way which had virtually disappeared in England. As well, the Americans were still making all-malt products (pale ale, strong ale, stout) while British breweries generally adopted sugar or maize adjunct, with various justifications. Still, American cream and crystal ales and perhaps musty ale were an adaptation of styles inherited from Britain and showed traits borrowed from the nation’s burgeoning lager culture. Another country where British beer had a long history either directly (through imports) or by influencing local brewing, was France. In the 1970s when Michael Jackson started writing about beer, he explained that English beer was chic in Paris. In truth it has been so, in France generally, for 200 years and more. Being inland and a great French and international city, Paris was such that British beer, while making a mark, tended to get lost among the wines and French beers. However, in the 1840s in Boulogne on the coast, English and Irish beers were big sellers and well-represented. This is partly because Boulogne then was an English resort, frequented by upper and prosperous middle class tourists. Many were passing through but some stayed for the season. A cottage industry sprung up in the town of English-run and staffed businesses to supply needs familiar from home. There were hotels and taverns, bakeries, florists, beer “depots”, insurers, bird-stuffers, even undertakers – all the comforts of home. An English-run hotel and bar, the Royal Oak, had a good run in different locations in town in the mid-1800s. You can see the beers it offered in this 1846 guidebook, a “Tableau” published to help visitors. If you turn the page you will see a similar ad from the indubitably English Stubbs with his beers listed. Yet further examples are strewn through the book. Bass East India Pale Ale is mentioned, for example. In this period, and as Boulogne was (relatively) far from England where trends accordingly were slower to appear, stout, porter and strong ale hadn’t been eclipsed by the rising star at home, pale ale. Porter and stout must have been the major draw in the Royal Oak as they are listed first, indeed pale ale appears last. 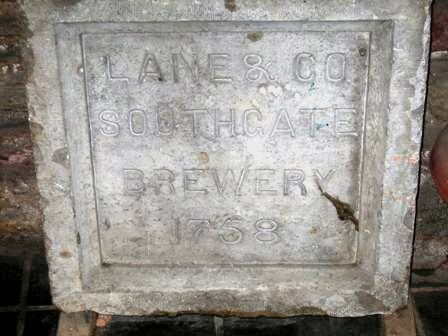 Lane & Co. of Southgate, Cork supplied most draught and bottled porter and stout. Reid’s stout was offered and bottled Guinness but the way the ad is written shows the Lane offerings were primary. Lane & Co. were choc-a-bloc to the more famous Beamish & Crawford, and much smaller. When pioneering beer writer Alfred Barnard was in town to take in details of Cork productions, he visited the big shop only. Still, Lane’s beers must have been good enough to fetch an export market. Cork’s harbour facilitated such trade, as for its corned beef exports which I discussed earlier. It may seem unlikely that some decent taste notes of Lane’s beers survive, but they do. In 1883 the beers were exhibited at the Cork Industrial Exhibition. The judges were rather more explicit on the beers’ qualities than often appeared in such affairs. The porter was described as “full, sweet, clean”, the stouts as bitter and durable although one was thought to contain preservative. You can see the details at pp. 344, here. (The comments on Beamish’s beers are interesting, too, the description of its single stout applies to a t for many craft stouts I know!). I would think the journey over to the French coast probably didn’t hurt the beers too much. The North Atlantic climate too is equable – from a beer standpoint – and turnover must have been good. I always liked Boulogne. It was the second French centre I visited, the first was Calais and both reached over water from England in the 80s. Boulogne unfortunately was bombed in 1944 and the lower town has many modern features, but the Upper Town survived better. Still, it’s a charming place to walk around and the fishing industry is still important with its produce well-represented in the local restos. Boulogne, being in the French north, has a brewing heritage of its own, which deserves its own article. Suffice to say it had a brewery, Facon, into the 1980s. It made the peach-coloured Saint Léonard, a bière de garde. The brewery closed before I got there but the brand was later made elsewhere in the north, and maybe still. Canadian Fifth Infantry fought the Germans there in 1944, and its contributions are recalled in at least one local memorial. Lots to think about walking around in, or writing of, Boulogne-sur-Mer, including the many parallels to Quebec province in architecture, surnames, even the way of talking. Ben oui. Note re image: The image above was sourced from the Brewery History Society site, here. All intellectual property in or to the image belongs solely to its lawful owner or authorized user. Image is believed available for educational and historical purposes. All feedback welcomed.